As I write this, three hikers are missing on the Pacific Crest Trail. One hasn't been heard from since April, which brings up fearful thoughts of snowy Fuller Ridge. The other never picked up her resupply package north of Yosemite and was last seen July 17th. Last week another hiker was found submerged in a dangerous creek crossing. She didn't make it. The last disappeared in October and has never been found. The chorus has begun again, saying that people should not hike alone. It's true that if the hiker who drowned had waited for others to help her cross, the outcome would have been very different. But we all know of friends who have died in the mountains, their companions by their side. The truth is that the wilderness is never going to be completely safe. I've hiked a lot with other people lately, and I get it. It's nice to have someone else to consult when the trail disappears in snow or when you have to balance precariously on a log at a creek crossing. When you are on the struggle bus going up a hill (or in my case, downhill) it's good to have someone else to hear you whine. Decisions--where to camp, should we get water here, should we turn back; all of those are good to share. And let's be honest--hiking while female brings its own dangers. I have been fortunate that I have only met a couple of sketchy people in the woods, but it's something that men will never really get. I once knew a man who really wanted to go on a cruise, but he put it off, saying that he wouldn't go until he had a girlfriend to go with him. In the decades since, he has yet to acquire said girlfriend, so he has stayed home. I feel that way about hiking solo. If I wait for someone to go with, I won't go. Going is more important. There are ways to stay safe. You have to be willing to turn around. You have to admit when something is too hard, or too dangerous. You have to pay attention to all of the little things that can add up to something that you can't come back from. And you have to know that, despite all this, something can go wrong. It can go wrong even if you have an army with you. That's just the way the wilderness works. Trail sisters and brothers, I hope you are all found safe. Reaching the PCT from the Elk Lake cut-off trail, I caught up to a slow-moving man with what looked like a stuff sack strapped to his back. "I'm going slow because my knee hurts," he was quick to say. Whatever, dude, I don't care! "Your pack looks pretty ultralight," I ventured, trying to lessen the apparent sting of a woman passing him. "It's really heavy," he complained. "Seventeen pounds!" "It doesn't have a waist belt," he hollered as, giving up, I sped past. Seriously? As I hiked into the evening, negotiating a few snow patches, I thought about the pictures I had seen in the PCT coffee table book of 1970s travel. The men in there carried huge external frame packs, were usually shirtless, showing six-pack abs, and, bonus, had short denim cut-offs. How did we go from that to 17 pounds being heavy in only 40 years? I soon had more to think about at my destination, Sisters Mirror Lake, which I renamed "Sisters Mosquito Lake". Donning my head net and rain gear, I hurried down to the lakeshore where I hoped to eat with some sanity. Instead, a man in a full net suit approached, wanting to know where I was headed the next day. Sisters Mirror Lake. Beware of mansplainers, ladies! "Oh, probably South Matthieu," I said, knowing that it was 21 miles and that I didn't have to hike that far, but I could if I wanted to. Skeeter Suit's face took on an expression I know well. I was about to be mansplained! "I think that's a little too ambitious for you," he intoned. I sighed as he droned on about a nice lake eleven miles away and how much climbing there was ahead. Would he have said this to a male hiker? Nope. Ladies, how much longer are we going to have to put up with this kind of stuff? The only thing Skeeter Suit was right about was the climbing. There was a lot of it, but it was through such alpine, mountain-studded country that I didn't mind. There was also enough snow that I had to consult the map on a frequent basis. After one such location, a guy approached me southbound, a cute dog in tow. Inexplicably, he was carrying an oven mitt, which I just had to ask about. "What's up with the oven mitt?" I asked. Looking embarrassed, the guy muttered something about it keeping his "paraphernalia" dry. Thinking about it, I did detect a certain fragrance. Whatever, dude! Obsidian lined the trail in the Limited Entry Area. You have to enter a lottery to day hike here, unless you are hiking through on the PCT. No camping is allowed. At about mile 18 I caught up with two women section hiking from Crater Lake to Highway 20 and hiked with them for a few miles. Go ladies! When they stopped for a break I reached a steep, snowy traverse. What to do? It looked like most people had glissaded straight down, but that looked like a one way trip to the emergency room. I saw what looked like a beaten track through the snow, straight across the traverse, and decided to try that. Too late, committed, I saw it was only one set of footprints, and they were shallow. Kicking in steps, I held my breath until I was safely across. Soon I was at my campsite, a lake nestled in a small bowl--21 miles, so there, Skeeter Suit. Best of all, the mosquitoes had inexplicably disappeared, perhaps courtesy of an evening frost. South Matthieu Lake--a perfect place for a swim. The traverse looks way, way less scary here. Picture a steep free fall. For every good day on the trail, there is often one that is not so good, and the next day was it. I had planned on a shorter day, but as I trekked across Highway 242 and into an unending lava rock climb, I realized that the whole stretch to Santiam Pass was dry. No water, for 21 miles, unless I wanted to go off trail to get it. I only had capacity for 3.5 liters, which was enough for the hike but not to camp also. Besides, the camping was limited on this stretch, seeing as it was mostly lava or burnt trees. It looked like another 21 mile day was in my future. Pretty volcanoes all in a row. And lava. So much lava. It was hot, oppressively so, and the only relief were brief patches of unburnt forest. On one of those stretches I encountered a strange sight: Camo Santa and his 4 camo-clad elves. I just had to ask: "What's up with the camo?" Looking annoyed, because probably many others had asked the question, one of the elves explained that they were scouting for elk and were trying out the camo outfits to "see how they breathe." Whatever, dudes! There were a few pretty, unburnt sections. I stumbled on through a blazing forest, finally reaching Highway 20. In order to get to the rest of the trail and the parking lot, an intrepid hiker must sprint across several lanes of oncoming traffic. Forget the bears and mountain lions, this is the scariest part of the hike. Luckily, it's not eclipse weekend, so I made it across without incident and completely out of water. TL; DR: Strange encounters, mansplaining, camo, camo, camo, alpine gorgeousness, lava, burned forest, 48 more miles of the PCT hiked! Back in the day, I filled in as a relief fire lookout in Kings Canyon National Park. What I remember best about those times were mild fear that a fire would start and I would have to accurately pinpoint it using the fire finder, and annoyance at all the people who sweatily hiked to the base of the tower and asked to come up. In the time since, I have dreamed of working at a lookout all summer--just think of how much writing I could get done (minus tourists of course). There are a few fire lookouts that ordinary souls can rent, though the competition is fierce. Through a lucky circumstance we were able to snag a night at the Green Ridge Lookout, which overlooks the Metolius Basin. Normally you have to leap onto recreation.gov and reserve it as soon as it comes open (January 1, I think). This lookout in particular is staffed in summer, which means there are only a few precious weeks for us regular folk. Ruby scans for fires on the deck below the lookout cabin. You can drive to this lookout, kind of spoiling the romantic vibe of a solitary hike to a remote peak. However, there's a gate with a combo lock, which keeps most people away, even though it's a short trot down the road to reach the lookout. We arrived late in the afternoon, just in time for a short hike/bike ride on the Green Ridge trail. This trail is still in the planning stage, so it petered out in a couple of directions. When it is finished, it is going to be spectacular. It hugs the rim, with some great views. I ran along another part of it the next day, chasing J on his bike (honestly, I do this a lot, because the trails he rides are too technical for me. I find I can keep up on hills. Any other time, not). A crimson sunset fell over the lookout and a robe of stars spread out over the Cascade volcanoes. Somewhere down below us, there were thousands of people, but up here, there was only a cool breeze. This lookout has unheard of amenities, a stove, refrigerator, and an outhouse that is among the nicer kinds. I could live up here forever, I thought. Ruby on a big field of sun cups. Only a few other souls were braving the Tam MacArthur Rim today, and none of them were staying overnight. It was admittedly too early. Huge snow patches covered much of the trail. In early morning, much of the traverse we were doing would be treacherously icy. Under the glare of an unrelenting sun, though, the snow had reverted to a sloppy consistency reminiscent of potatoes. Ruby on a small patch of snow. This was all melted out by the end of the day. 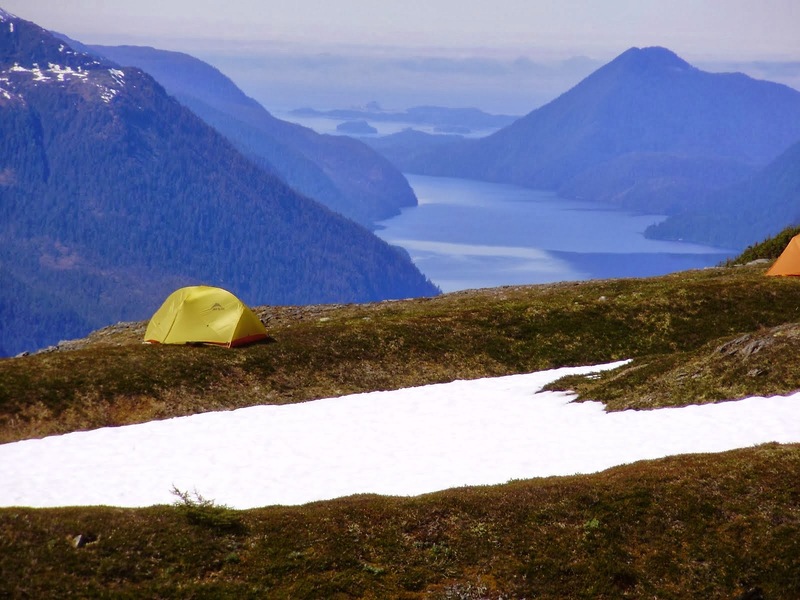 We had veered off trail and set up our camp overlooking a view of far-off mountains, and set out to explore the rim. It rises a thousand feet above Three Creeks Lake and has an in-your-face view of the Three Sisters and Broken Top. It is a really quick ascent to alpine country, my favorite. But the going was slow. After J's run down the mountain, we decided to return to camp. In a rookie move, we discovered much of the rim, especially when snow-covered, looks very similar. Was it in this patch of trees? This one? No, no it wasn't. Just when I was contemplating the fact that we might have to spend a night out (we had matches and extra clothes, but it wouldn't have been that great), J found our camp, farther to the east than we had remembered. It's easy to be nonchalant when you have been backpacking all of your life. Do not lose the camp! It was our wedding anniversary, and as I stumbled into camp after ten hours of difficult snow travel, I wondered why I couldn't be content with dinner out, why I insist on these trips that are both hard and magnificent. But this kind of thing feeds my soul. A full moon rose over the Rim just as an army of mosquitoes descended upon us. The dreaded Cascades mosquitoes! I have no idea if they will go away as the summer winds on, but clearly I need to learn mosquito management. It's been forever since I have had to deal with them. It doesn't appear to cool down much here at night, so the mosquitoes were still hanging around. News flash: the natural stuff may work in your neck of the woods, but these skeeters are undeterred. We packed up quickly. "This was a nice camp," I said. "Easy to find," J replied. We laughed. *sun cup: deep, annoying hollows in snow when it is beginning to melt out, creating slippery and hazardous walking. Good thing I still have the headnet from Interior Alaska firefighting days. We hiked through a dusty, thirsty forest. How could it be so hot at five thousand feet? But it was. Ten miles out of Chester, we stopped at the North Fork of the Feather River, one of the few water sources out here, just outside of Lassen National Park. Our only companion was a thru-hiker inexplicably clad in hiking boots (most thrus wear running shoes) who also inexplicably started a campfire. It was way too hot to sit by a fire. Fire Boots, as we dubbed him, told us he was hurrying to catch up with his friends, but had stopped early to camp, inexplicably. We never saw him again. The whole thing was a mystery. In fact, this whole section was mysterious. The first three days we hardly saw a soul, although we had heard rumors of crowds of thru hikers, terrified of the Sierra snows, skipping up here to walk on dry trail. Strangely, nobody was around. There was also the man who ran past us having apparently misplaced his pants, since he was clad in plaid boxers and wool long underwear bottoms in eighty-degree weather. What was up with that? The reward for a climb. Crossing into Lassen National Park, we were well aware of the weight of our required bear canisters. A recent policy change has made these mandatory, though nobody asked to see ours. Despite our need to press on, we lingered at the strangely alluring Boiling Lake. The Chips fire roared through part of this section in 2012, changing things for generations. This was the case at Swan Lake, our second night's destination. The downfall and standing snags made camping nearly impossible near the lake, but we finally found a hidden site that the fire had left untouched. Just getting to this spot was challenging--a tough winter has brought lots of deadfall and left lingering snow, enough that we had to scout for the trail. The next lake in the chain, Twin, had been spared the worst of the fire. While this section was puzzling, it was also brutal. Mostly flat, it was not the elevation that was the challenge. We packed by headlamp to begin a 29 mile waterless stretch across the Hat Creek Rim. An escarpment rising high above the surrounding landscape, the Rim does have one spring, but you must descend .03 miles to get to it, losing 500 feet of elevation. Ringside seat for the sunrise and sunset on the Rim. Still, the Rim is beautiful, one of those starkly beautiful places where you know survival is only possible by carrying enough water. Burdened by four liters, we trudged through blazing sun. Jan put up her umbrella and I was jealous of her portable shade. Still, we were both glad when we found a dry campsite with a sunset view of Mount Shasta, some red-lit wind turbines, and the peaks of Lassen National Park. In the morning, we still had eleven miles to cover to the next water source. We dropped off the rim, the heat intensifying. The water source was a sluggish little creek and we agreed to press on to a river shown on our maps. However, when we arrived it was a fishy smelling place. "I see a spigot," Jan said, climbing over to fill our dirty water bags (we filter from these). I imagined a faucet, but looked over to see her filling from the discharge of the hydroelectric plant. Oh well--that probably isn't going to be what I die from. A few generous souls maintain water caches in this section, but it's best not to rely on these. However, one called the Wild Bird Cache lifted our spirits with cold lemonade and pretzels. Thank you, trail angels. This was not a water cache. Just a random chair in the middle of the woods. Another mystery. Though we had planned more time for this hike, in the end we covered 88 miles in 4.5 days, ending at the luscious waterfall at Burney Falls State Park. (Note to future hikers--if you come into the State Park from the north, do not camp at the headwaters "PCT camp" unless your idea of a good time is to bake in a clear cut over half a mile from the falls, the river, or the camp store. Head to the park itself, which has walk-in hiker/biker campsites for $5 a person). A few thru-hikers straggled in, all with their own tales of snow in other sections. Back at the Feather, we had met the first person (we think) to make it through the Sierra and get this far without a flip or a skip. Hike on, Breeze from South Carolina. The TL, DR: This is not a section for the faint of heart. It's not the most scenic, though it has its moments. This section brings me up to 1,660 miles of the PCT completed--one thousand to go. Hopefully in cooler weather! Here you can read about my books and the life of an author. I live sandwiched in between Hells Canyon and the Wallowa Mountains. I like to write and explore the outdoors. Come along! Just because I love them. This is a very cute rescued part wolf dog. kitty and I hunted for rare plants here, Scariest float plane ride ever. I'm in love with this dog. We misjudged the tide on this one. this was proposed for a drawdown for power. thank goodness cool heads prevailed.